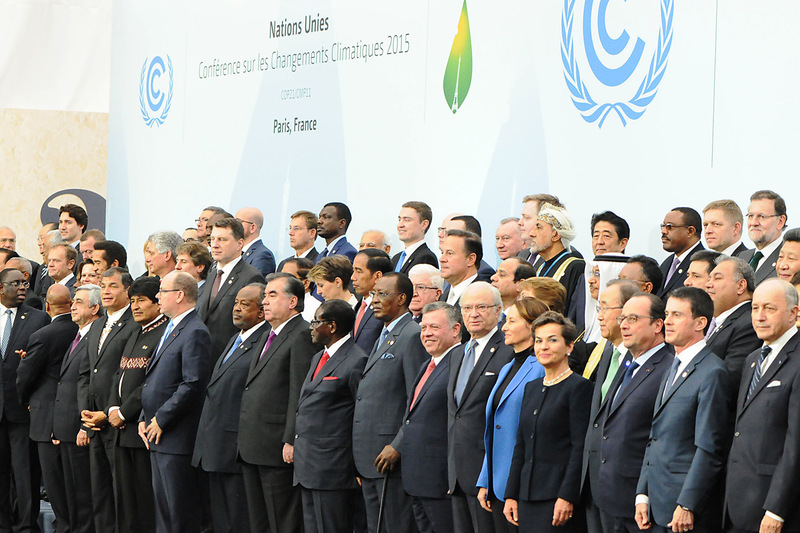 All smiles, no substance: delegates at the Paris climate talks gather for a photo shoot. COP21 has come and gone, and like most others before it, the response has been varied. Some have applauded the Paris Agreement as a giant step for humankind. Some are claiming a big win. Others take a holistic look at the future scenario the agreement presents and are aghast that after two decades of climate negotiations greenhouse gas emissions continue to rise and the Paris Agreement does not indicate any urgency in tackling this fundamental problem, even though it does indeed recognize the urgency of the crisis. The Agreement speaks of a desirability to work towards a temperature increase of 1.5oC while aiming also at a target ‘well below 2oC’. We wonder how the COP quantifies the difference between 1.5 and ‘well below’ 2 degrees. And which may be greater in this language of diplomats? The Agreement recognizes everything that needs to be recognized, including the need for finance and technology transfer, human rights, gender and intergenerational equity, but provides no scope for the operationalizing these in a manner that signifies this acknowledgment. Although it is generally agreed that fossil fuels must be kept in the ground if we are to stand a chance of keeping temperature increase below 2 degrees above pre-industrial levels, the COP, perhaps encouraged by its oil company partners, ignored this and locked the planet on the path of peril. The scaffold on which the entire COP21 hung was the infamous intended nationally determined contributions (INDCs). While the COP itself notes that the figures submitted by countries do not on the aggregate point a way to cooling the planet, it nevertheless stayed the cause of this clearly wrong path. The INDCs, if implemented, will lead to a temperature increase of over 3 degrees Celsius above preindustrial levels, wiping out communities of people and sparking unpredictable repercussions. The Agreement recognizes that INDCs will also be achieved through removal of greenhouse gases – through sinks and offsets, for example. Thus, the path of the INDCs taken by the COP is an irredeemable self-inflicted injury that subverts real efforts to tackle the climate menace. Applauding the COP for being a success because for the first time all nations have indicated commitment to tackle climate change on the basis of the INDCs indicates a total disregard of climate science and equity as epitomized by this pathway. We note that the Agreement speaks repeatedly of ‘sinks and reservoirs of greenhouse gases’. These are wedges to keep the door open for all sorts of carbon offset schemes, including REDD and all its variants, yet-to-be-proven carbon capture and storage, geoengineering and such like. We can thus expect intense externalizing of climate action on climate victims as well as carbon colonialism – which may include what is referred to in the Agreement as ‘internationally transferred mitigation’ (Article 6) rather than direct in-country carbon emissions reduction. The agreement ties non-market climate solutions to the enhancement of ‘public and private sector participation in the implementation of nationally determined contributions’. This hints at the privatization of carbon or pollution, which arguably is already happening through carbon trading. Climate finance remains grossly insufficient, with targets of $10 billion yearly up to 2025 (COP15 said 2020), when this would shift to $100 billion yearly. That these amounts are insufficient can be seen from the fact that the US spent about $68 billion to handle the aftermath of just one hurricane, Sandy. Considering that rich countries spend up to $2 trillion annually in needless wars underscores the fact that what we are seeing is specious power play and climate apartheid. And, by the way, who accounts for the millions of tonnes of greenhouse gases released in warfare? Quite apart from the destruction of lives and the wreaking of havoc on nations and territories, especially those that are fossil-resource rich. It is clear that the paucity of the Green Climate Fund is not due to a lack of available funds but to a determination by rich countries to avoid historical and current climate debt. The Agreement makes a passing mention of ‘just transition’, with reference to ‘workforce’ and the creation of decent work. Again we see that the COP is so enamoured with dirty energy or fossil-driven energy forms that it dared not name fossils or a call for just transition towards renewable energy. In fact, ‘renewable energy’ is mentioned only once in the preamble to the Agreement and in the context of developing countries. From where did analysts get the idea that the Agreement has declared the obituary for fossil fuels? With 2020 as the pivot year for the voluntary emissions reduction, it is clear that between now and then the remaining atmospheric carbon budget may already have been taken up. Whether that happens or not, delaying actions until 2020 presents the planet and all beings on it with a very dire future that many will not survive. It also breeches the right of Mother Earth to exist and her right to maintain her cycles, and it speaks poorly of our understanding of intergenerational equity. In sum, COP21 betrayed the poor, the vulnerable and all those already suffering the impacts of climate change. It set the stage for a climate-changed world, and did little about averting it. Nnimmo Bassey is the founder of Health of Mother Earth Foundation and Board Chair of Global Grerngrants Fund.